Alexander McQueen’s Sarah Burton fuses her love of nature and history to create this black wool-blend poncho. A modern interpretation of a medieval tapestry, the textured-jacquard fabric is deftly woven with flora and fauna, as well as the brand’s recognisable skull motif, and edged with plush fringing. Drape it over classic monochrome separates – it will quickly become a treasured investment piece in your winter wardrobe. Britain's rich history continues to serve as inspiration for Sarah Burton at Alexander McQueen, who looks to the enchanting Cornish coast and it's preserved traditions to design this ivory textured stretch-knit cape. 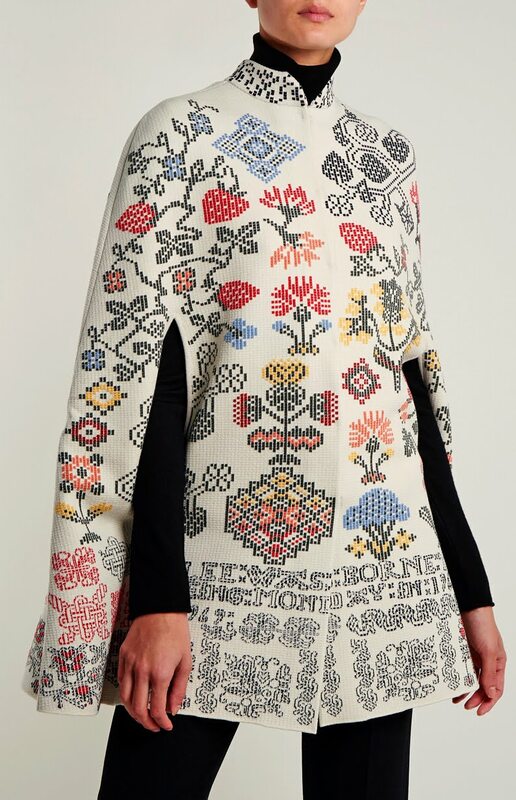 It's adorned with multicoloured cross-stitch intarsia featuring British flowers and strawberries, and finished with slit armholes for easy styling. Drape it over the shoulders of top-to-toe black. 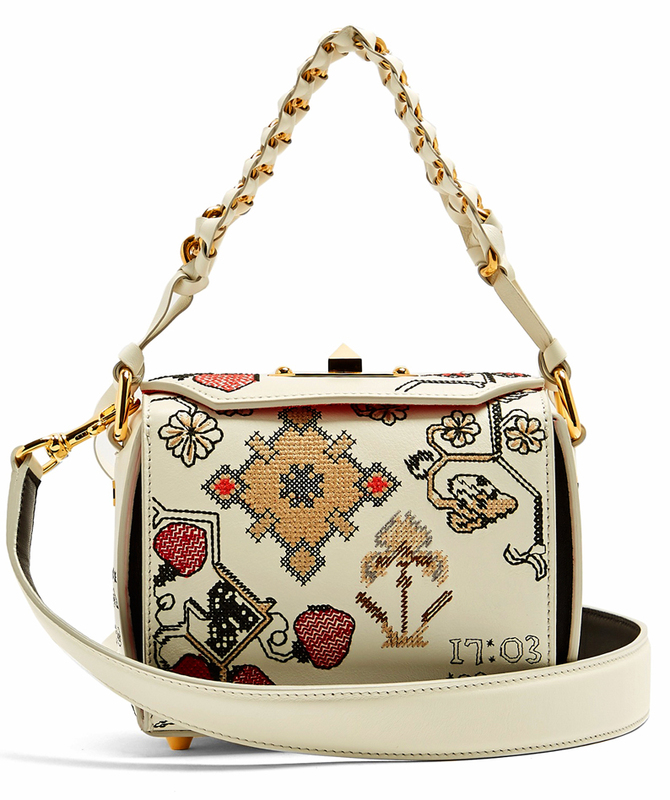 Alexander McQueen's mini cream leather shoulder bag is decorated with black, beige, and red embroidery for a textural richness typical of the brand's AW17 runway show in which it was carried. Tote yours alongside a chic white blouse and understated denim for a fresh autumnal look. 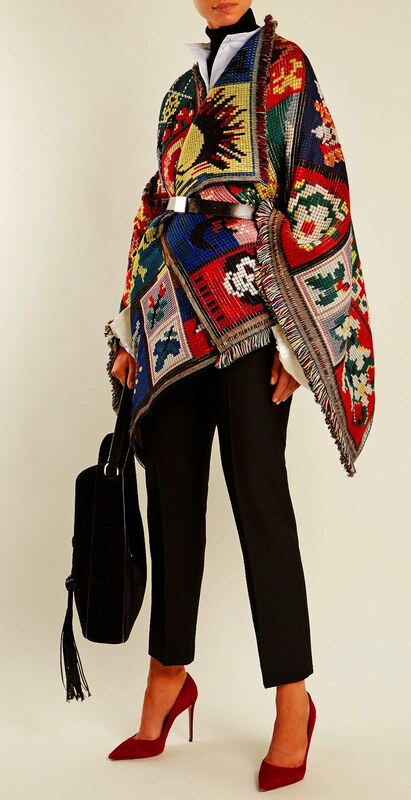 Alexander McQueen's black cross-stitch jacquard cardigan is a bold exercise in texture, pattern, and colour. It has slightly cropped sleeves and a close fit, for a fresh and contemporary feel. Wear it with the matching A-line skirt for a head-to-toe statement.